We are pleased to announce a new martial arts event in Okinawa. 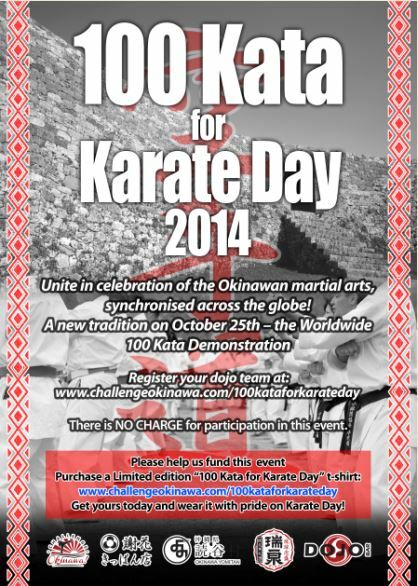 A kata demonstration event open to all styles and dojos, this is a celebration of Okinawa martial arts to be held on October 25th – ‘Karate Day’ in Okinawa. Inspired by the classic karate phrase – 百練剛- “Train hard 100 times”, we propose a 100 kata performance starting at sunrise on Karate Day. The event will commence at 6am (Japan time) on October 25th 2014. Each participating dojo is asked to select a kata which will be performed for 100 repetitions. 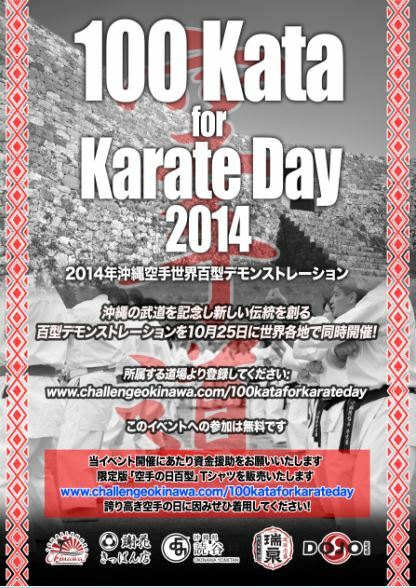 There is no time limit for completion of the 100 kata but we expect the event to last around 2 hours (120 mins). We strongly encourage everyone to take part in this historic event regardless of style, level, age, etc. As they say in Okinawa – ‘Ichariba chodei’ , “once we meet we are all brothers and sisters”. On Okinawa the event will take place inside the grounds of Zakimi Castle Site, located in Yomitan village. 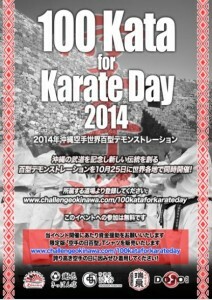 We expect 500 participants from local dojo. Outside Okinawa we invite overseas dojo to join the Okinawa participants in this simultaneous event. They will start at exactly the same time (equivalent of 6am Japan time) and can share video and photos on our Youtube channel afterwards. 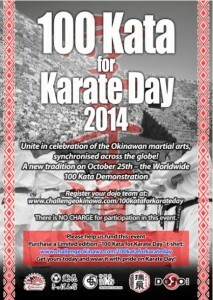 We aim for 100+ dojos or 5000+ overseas participants who will all have a keen interest in karate and Okinawa.